Retina-X products, Mobile Spy and PhoneSheriff can no longer be considered stealth monitoring apps. It is impossible to hide the application on the cellphone, or delete the icon. And, the service also periodically displays a popup message advising that the device is being monitored. Although this can be acceptable for some parents, employers will find it annoying, and even counteractive to productivity due to the constant notifications. This also negates any advantages that stealth mode presents in the even that a device is lost or stolen. Finally, all recording, and remote camera/microphone features have also been removed. Offered by the same makers of Mobile Spy, Retina-X studios have developed a very similar product with a slightly more limited list of features but with some unique capabilities not found elsewhere and more geared towards parents, while still offering business packages. 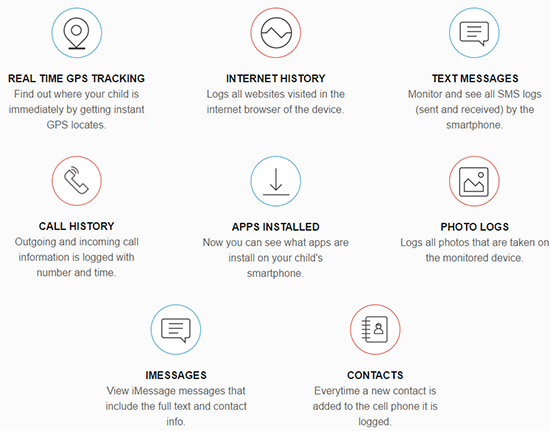 PhoneSheriff offers a smaller amount of logging features, coupled with parental control capabilities, including time usage restrictions. They use to offer stand-alone program to monitor iPhones and iPads without having to jail break or install any software, but they have since rebranded that service to another name. The service is called TeenShield and uses the iCloud system to monitor and track without detection. It is not as complete or real-time as using the full application, but a good option for parents that don’t want to go through the trouble of jail breaking their child’s iDevice. Due to not having tested TeenShield yet, I would suggest to opt for some of the better known jailbreak free iOS monitoring services available, if that is what you’re seeking. The service operates as advertised and has a similar feel to Mobile Spy. Unfortunately, this includes the newly adopted, legally mandated, notification which advises the device user of the active monitoring. Call History: All calls made and received saved and logged with timestamps. SMS Monitoring: Log all text messages on targeted device. Instant Messenger Logs: Monitors WhatsApp, iMessage and BlackBerry Messaging. Multimedia Access: View photos saved on device. GPS Map Tracking: Monitor live location and path history. Geo-Fencing Alerts: Get alerted if device exits pre-set safe zones. Contacts & Calendar: View contact list and calendar activities. App Control: View installed and used apps and block any apps. Set Usage Timer: Set limits of how long the device can be used for, or use set times to unlock. Anti-Abduction: With parents in mind, this feature traces the device’s history path and live location while taking stealth camera photo shots and recording the surroundings with the microphone. Panic Button Alert: For further child safety, an alert can be sent from the child to parent at the push of a button, providing you with their GPS map location. Remote Commands: Set off alarm, lock/unlock device or uninstall PhoneSheriff remotely. Theft Protection: SIM Card change alert and full backup + wipe device data remotely. Alerts: Profanity and custom set monitoring alerts will send notifications for various filters. Displays pop up notifying device user of active monitoring. Lack of advanced tools such as key logging or remote camera video activation and call recording. Lack of 24/7 Live Support. Overall compatibility is great and all functions can be quickly checked on their OS requirements page, as well as the features. By looking at the bottom of each feature, you can see which device OS is supported and while pretty much everything is available on Android, Apple and BlackBerry, some differences from one device to another exist, as with any other spy app service. Tablets and iPads can also be monitored but also present some limitations. A more restricted but still interesting list of features extend to Windows and Symbian devices. Android 2.1 – 5.1.1 – Some versions excluded – rooting required for most features. iPhone 3.1.3 – 9.0.2 – Must be jailbroken for all packages. iPad 3.2 – 8.1.2 – Must be jailbroken. 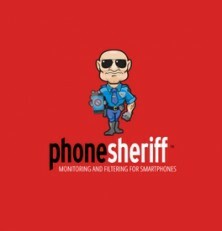 Like it’s sister Spy Apps Mobile, PhoneSheriff is owned by Retina-X studios; a US company. This means they, like many others, are now legally bound to show a notification informing any device users that the device is actively being monitored. In addition to an icon or persistent notification in the notification bar, a pop up will be displayed on the device a minimum of once every 24 hours. Needless to say, this renders the software much less effective given that users are much more likely to change their browsing behaviors when constantly being reminded they’re being watched. The company does not offer 24/7 live support, but you can reach them from 9am-5pm EST time on chat or toll-free calling for any type of support issue. This may not be as good as some competitors, but matches the same support timeframe offered for their counterpart service; Mobile Spy. The technical support quality level is just as good and you know you are in good hands. As we have said previously, Retina-X Studios has been around for years, so you can expect their apps to receive regular updates to keep up with mobile hardware devices and operating systems. The cost of service is fair and just a bit lower than leading competitors and for the long range of tools you get to use, the value is great. If we compare PhoneSheriff to Mobile Spy, this service is geared more towards parental monitoring of their children, while the ladder offers a more complete and pro software solution. The company has a very strict no refund policy, unless you have an unresolved technical issue after dealing with support, no refunds will be issued. If you did not check compatibility properly, and your device is not compatible, no refunds will be issued. Additionally, any unwarranted use, such as spying on a device you don’t own, is also not covered for reimbursement. Due to the lack of advanced features, and no stealth mode, there’s a whole lot of lost value in this service. Although they have cool parental control features, the same features can be found with competitors, without the negative downsides of having constant notifications on the phone. If the device gets stolen, the person will know it is being tracked, and if you’re a parent that wants to monitor your child’s online activities without notifying them, this service cannot provide that. Also remember that no refunds are ever provided unless there was a technical problem their team was unable to solve. As their terms state that all sales are final, regardless of compatibility issues. Otherwise, it’s a good value buy for your money if it provides all the features you need. I was very disappointed with Retinax /Phone Sheriff. I purchased for my daughters iPhone 6S plus with latest IOS as it stated “Compatible with Android, iPhone and iPad” and used downloaded version. Then informed that i needed to Jailbreak phone. Jailbreak doesnt work on this verision. Curt response from support saying i should had looked at small print before buying. This is probably the level of service and support you can expect fro this firm.